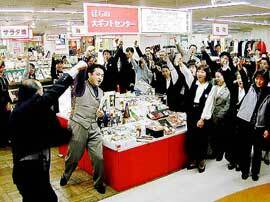 Department store employees prepare themselves for the Oseibo season. Like ochūgen in summer, the oseibo season in winter is also a time to give gifts. In the past, people delivered new year’s offerings to their parents or the head family before the end of the year. Oseibo originates in this custom. Contemporary oseibo is not concerned with new year’s offerings, but serves as an occasion to thank anyone who has been of help by giving a gift. As they do at ochūgen, many people send food items, seasonings, or household goods as oseibo gifts. Although the oseibo season is in December, department stores set up merchandise for oseibo as early as November. In the past, people went in person to deliver the gifts and greet their benefactors, but these days, many have gifts sent directly from a department store or an internet retailer.